Comments Off on 2nd Marathon of the Year! Whilst it was a quiet weekend on the racing front, many Termoneeny Runners, still managed to get out and attend parkruns and local races. We had parkrun age grade course records broken (Tommy Hughes) and Christian Fortes O’Neill managed to squeeze in his second marathon of 2019! It was fantastic to see so many Termoneeny runners attend a training run in Portglenone Forest, on Sunday Morning. The purpose of this training run; was to raise funds for two local St. Pat’s student; who were fundraising for school Aid Romania. Well done to Kieran Henry, who ran a great time at his first parkrun on Saturday. Kieran crossed the line in a great time of 26:48. It’s wonderful to see Kieran back out running after a lengthy absence. Congratulations also go to TRC members; Gary and Anne O’Doherty’s son Luke; on his first parkrun. Luke was 4th in MUSA in an excellent time of 19:40. Thomas Doherty, achieved a new parkrun personal best time of 19:01, at Antrim on Saturday morning. Thomas finished fourth overall. A fantastic result for this athlete. Tommy Hughes, ran a sublime parkrun personal best time of 16:53, in Victoria parkrun Belfast on Saturday. He finished fourth overall. Tommy’s times are getting more impressive week on week. Tommy broke the Age Grade course record at Victoria Park and achieved a world class 94.18% (age grade). What an amazing achievement. Well done Tommy. We look forward with excitement, to see what 2019 holds for this legend. The third race in the 2018/19 Winter League Trail Series took place in An Creagan on Saturday. This 5-mile race comprised two laps of this scenic course through the forest finishing at the reception buildings. This race was attended by 5 Termoneeny runners. Congratulations to everyone on completing this scenic 5-mile course on a wet and windy day. Many thanks to Sperrin Harrier’s for their excellent hospitality. Results: Michael Burke 33:51; Stephen Pickering 35:09 PB; Orla Hatt 35:54; Kevin Darragh 35:55; Kevin Duggan 39:22. The weather was horrendous with rain and strong winds. Christian did not let difficult weather prevent him from running a fabulous time of 4 hours and 11 minutes. Well done Christian. How many marathons, will our marathon man run in 2019? Congratulations to all the TRC members who represent our running club near and far. 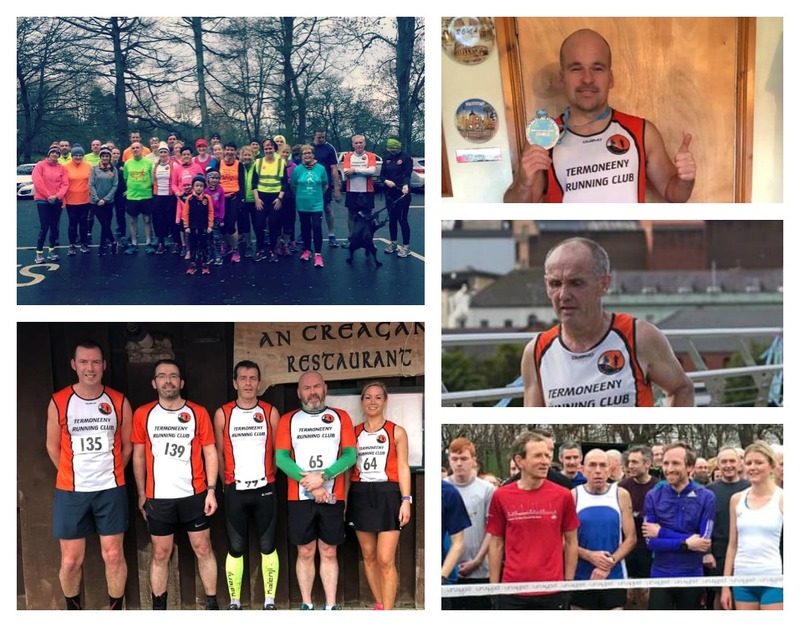 It is wonderful to see the TRC orange and white running top at so many events. If you are interested in joining TRC please visit termoneenyrc.com or send us a message on facebook.